Controversies, exhaustive deliberations and home secretary Ram Niwas being unceremoniously stripped of the education portfolio: All this about sums up the history of the UT administration’s continued bumbling on the Right Of Children To Free & Compulsory Education (RTE) Act, the implementation of which remains conspicuously absent in the city where the literacy rate has slipped from the sixth to the eighth highest in the country. Even as the water shortage crisis looms large in Mohali due to the repair work being carried out in the Bhakra main line, four new deep tubewells sunk by the Municipal Corporation and GMADA have still not become functional. The Department of Irrigation had decided to carry out the repair work in the Bhakra main line from today and the work will go on till April 21, which will adversely affect the supply of water from the Kajauli water works. 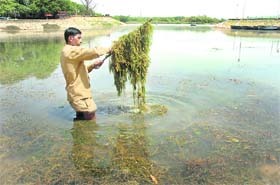 With the decline in water level, parts of the city’s famous Sukhna Lake have yet again begun to resemble a green playground owing to a large-scale growth of the weed “chara” or musk grass. The menace not only presents a poor picture of one of the main tourism spots of the City Beautiful, it also makes boating both difficult and dangerous. With a case disposal rate of 96.7 per cent, the union territory’s Consumer Disputes Redressal Forum continues to be the second best in terms of speedy resolution of complaints in the country, trailing the forum in Andhra Pradesh that disposed of 97.37 per cent of cases filed in 2010. The UT Excise and Taxation Department has ignored the demand of the Municipal Corporation to reduce the temporary liquor vends located on MC land on the internal roads of the sectors. As per the new excise policy announced by the department, the permissible number of liquor vends, which were 217 last year, has not been changed. Chandigarh Municipal Corporation Commissioner Roshan Sunkaria today issued a show-cause notice to five SDOs, asking them to explain why disciplinary action should not be taken against them for not attending the ward committee meeting of Sector 46 held yesterday. The Bhakra Beas Management Board (BBMB) has rejected the demand of the Chandigarh Municipal Corporation (MC) to postpone the repair of the Bhakra canal for three months. Members of the Panchkula Taxi Drivers Union protested near the office of the regional transport authority in Sector 5 here on Tuesday against the Haryana government’s move to “forcibly” install speed governors in their vehicles. 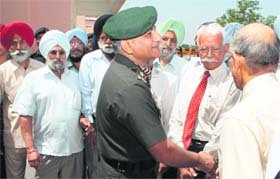 Chief of the Army Staff Gen VK Singh today visited Headquarters Western Command, Chandimandir, where he reviewed operational and training issues pertaining to the western sector. Fortis Hospital, Mohali, has successfully conducted a finger joint replacement on Balbir Singh, a former Armyman, who had sustained a gunshot wound on his right finger during action. A major tragedy was averted when a truck loaded with medicines and chicken feed caught fire near a petrol pump on the Chandigarh-Ambala Highway here late this evening. CTU bus services are not at all public friendly. Information available at the bus stops (if any) does not show the correct timings. There is no booklet informing the public about travel routes. E-mail your experience and any suggestion for the required change to the openhouse@tribunemail.com or write to the Open House, Chandigarh Tribune, Sector 29, Chandigarh. Engineering aspirants in the tricity have a reason to cheer with the PEC University of Technology starting three new self-financing courses, including a dual programme and two masters-level self-financing courses from the forthcoming academic session 2011-2012. High drama prevailed at the National Institute of Open Schooling, Sector 11, today where over 300 students protested against the authorities for not issuing roll numbers, even when Classes X and XII exams are starting from tomorrow. 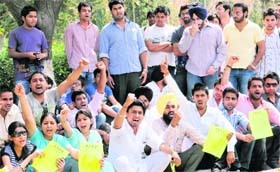 Reacting to the protest staged by students of the department of evening studies yesterday, Panjab University officials today said the university would not succumb to any pressure created by student leaders to issue roll numbers to ineligible candidates. On the issue of safe drinking water in girls’ hostels on Panjab University campus, nearly 70 members of the Student Organisation of Panjab University (SOPU) today staged a protest outside the Vice-Chancellor’s office. The spiritual wisdom, philosophy and ethical codes of life as enshrined in the classic epic “Ramayana” came alive in the light and sound dance drama spectacle “Shree Ram” presented by accomplished artistes of the Shriram Bhartiya Kala Kendra, New Delhi, under the aegis of Haryana Kala Parishad at Yavanika theatre here today. Three children from the Maloya area of Chandigarh were reunited with their family here today. Volunteers of Prabh Aasra Ashram of The Universal Care Taker Social Welfare Society united three missing children, eight-year-old Lucky, five-year-old Sagar Karan Singh and four-year-old Gopal. A bus driver and a conductor were injured during a clash with some youths at the Dera Bassi bus stand here last night. The police has booked three youths for the assault and damaging public property. Around 15 persons fell sick after consuming the special fasting flour (kuttu). The sick were admitted to civil hospital at Ambala City. Meanwhile, deputy commissioner Samir Pal Saro asked the people not to purchase kuttu flour from retail shops. Following the complaint of the drainage department, the Dera Bassi police has booked a construction company for obstructing the flow of water in a nearby choe. In a judgment against city’s famous furniture outlet, Glass Palace, the State Consumer Dispute Redressal Commision has held the company guilty of filing a “false” claim of Rs 44.38 lakh against Tata AIG General Insurance Company and has dubbed it as “a fit case for registering a criminal case of fraud and fabrication of document against the company”. A special court of Central Bureau of Investigation (CBI), the second CBI court in tricity after the Chandigarh CBI court, has finally started functioning from Panchkula. The Haryana government had issued notification regarding the CBI court in Panchkula last week, and it began functioning from the Panchkula district court complex today. The Government Multi-Specialty Hospital, Sector 16, today submitted a 250-odd pages inquiry report to the UT State Consumer Dispute Redressal Commission in the infamous Suman Desraj wrong blood transfusion case. The case will come up for hearing on April 25. The body of a 42-year-old man lay unclaimed on the Chandigarh-Mohali border today as the Chandigarh and the Mohali police spent more than three hours on deciding the jurisdiction. Finally, it was decided that the area was in Punjab and Mohali cops shifted it to a hospital. Fifty-six CFLs have reportedly been stolen from different electric poles near the Sukhna Lake in the recent past. Acting on a complaint by Kamal Kalia of the electricity sub-division No. 2, Sector 9, the police has registered a case of theft at the Sector 3 police station today. A teenager was stabbed in Colony Number 4 here today. The police has arrested two persons, including a minor, in a case of attempt to murder under Section 307 of the IPC. 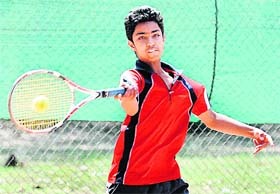 Naemat Aulakh lifted top honours after beating Pallavi Hooda 4-2, 4-2 in the final match of the U-14 girls’ category in Total Tennis Tournament being played at the YMCA Total Tennis Academy, Sector 11, here today. The Chandigarh Cricket Association (affiliated to the PCA) has selected 48 probables below 15 years, who will participate in the Chandigarh Premier League Cricket Tournament, starting from April 15.